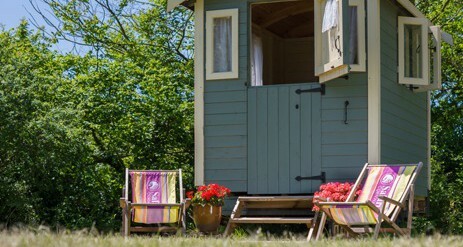 Come Glamping at the Orchard at Safari Cornwall. Our time spent in Kenya opened our eyes to how camping should be, close to nature, but in comfort and style. Coming home to Cornwall, we held on to that dream. We will help you make your holiday a truly unforgettable experience with exciting new adventures, spectacular scenery, and sundowners at dusk. Forget hard ground and thin bedrolls, instead, focus on sleeping in comfort, with duvets and crisp linen. Think hammocks and stripy deck-chairs! Couple that with taking up hand-picked opportunities to get close to nature, and you are talking Safari Cornwall. Duvets, beds, showers and all that… Imagine a Cornish orchard; apple, pear and plum trees, hedges laden with damsons and sloes, shaded by hazel and oak. Herbs grow in a corner. Now imagine it all to yourselves; no other campers to vie for the hammock or the hot tub, as peaceful as you choose to make it. 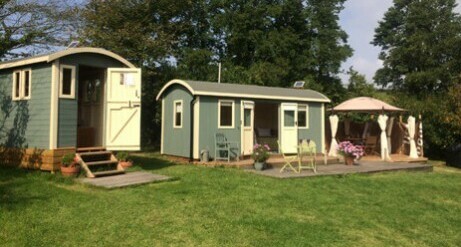 Totally private and designed for one family or group sleeping 2 adults and up to 4 child, The Orchard has two Shepherd huts waiting for you…. 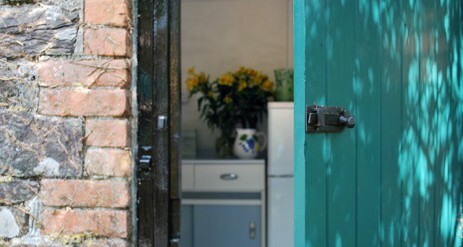 Some basics of life will be in the kitchen for your arrival, namely fresh milk, sugar, tea and coffee. Forget communal showers and cold water from a pump! Across the orchard is a (very private) hot mains pressure outdoor shower available at the turn of a tap. 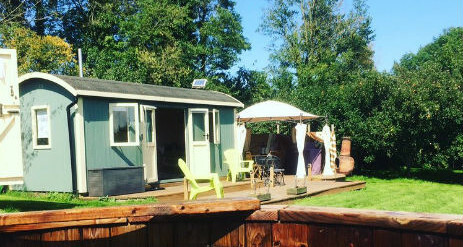 If you haven’t experienced showering under African skies on safari, now is your chance in Cornwall. We provide a set of towels for every guest, for use on-site, not for the beach please. 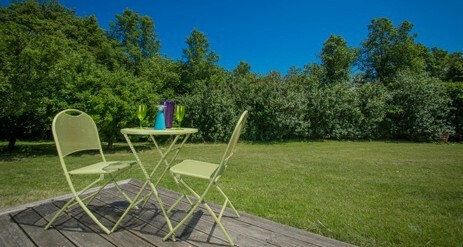 Within the Orchard is a modern hot tub. Whether your day has been strenuous or lazy, soak the stresses away. For a special experience, try the tub under the stars. The colder the evening air, the better the experience. Trust us, when you are hot from the tub, you won’t feel the evening cold, even when you get out. 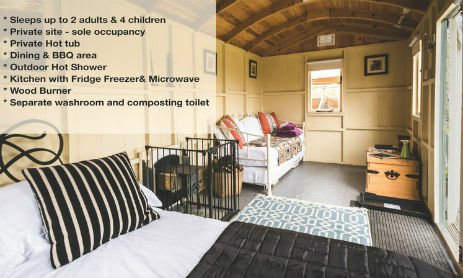 A tub takes upkeep and requires care; it is not to everyone’s taste, and so is not included in the basic rental, but is available if pre-booked as the only ‘extra’, with a one-off fee to cover the cost of set-up. There are no hidden extras. Logs for both the wood burning stove and for the firepit are supplied which should be enough for your stay; more can be requested at £5 a bag. Torches and lanterns are available. 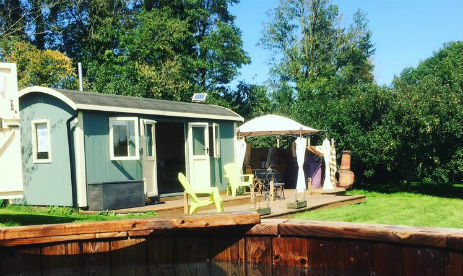 10% off any stay in 2019 and a free hot tub on stays of 7 nights or more. Please note offer excludes peak weeks.